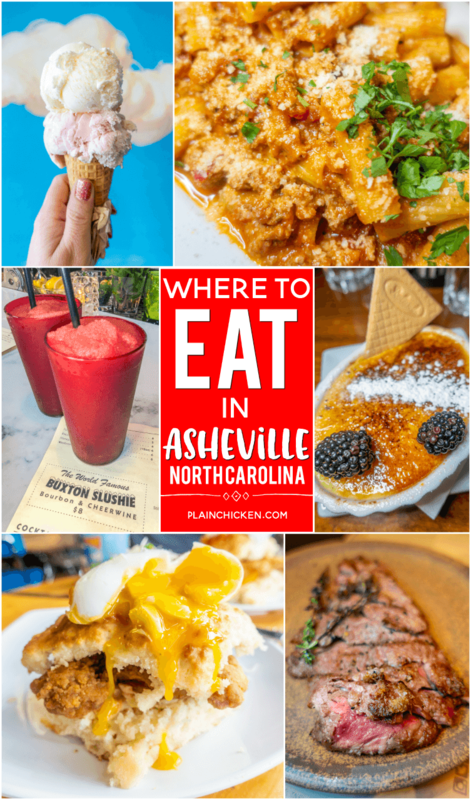 Where to Eat in Asheville, NC - BBQ, ice cream, Italian, Beer, Champagne, Spanish tapas, and breakfast! 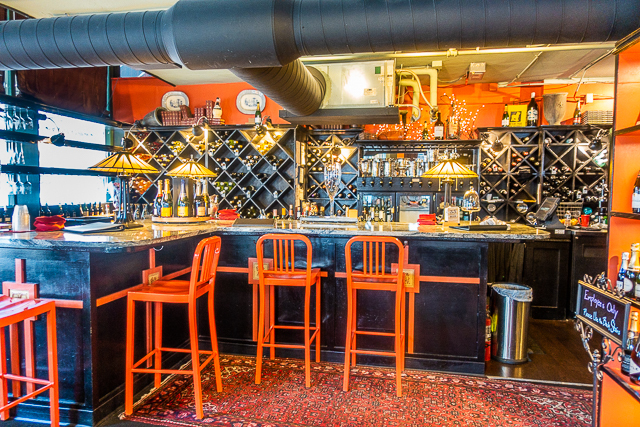 We checked out the top rated places on TripAdvisor and Yelp. We tell you what is worth going to and what to skip! We took a quick trip to Asheville, NC last week. We went to see the Chihuly exhibit at The Biltmore. It was AMAZING!! We were also super excited to check out the food scene in Asheville. It has really boomed over the past few years! We brought our stretchy pants and hit the town! Forks in hand. 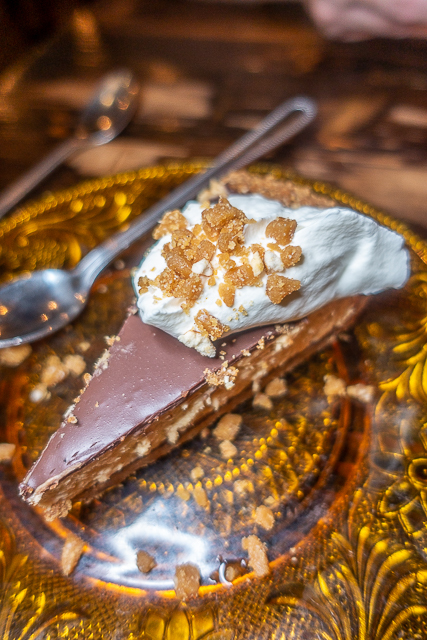 We found one of the best restaurants we've ever eaten at in Asheville. We ate the best pork EVER! You don't want to miss this place on your trip! We also hit up the top rated places on TripAdvisor and Yelp. We have been eating light since we got home. We ate SO much food!!! Most of it was crazy delicious! I was super excited to try Buxton Hall. I had seen videos about the restaurant and was dreaming of their banana pudding pie! We came on a Sunday night and only had to wait about 5 or 10 minutes. You walk in and put your name on the list with the hostess. They text you when your table is ready. 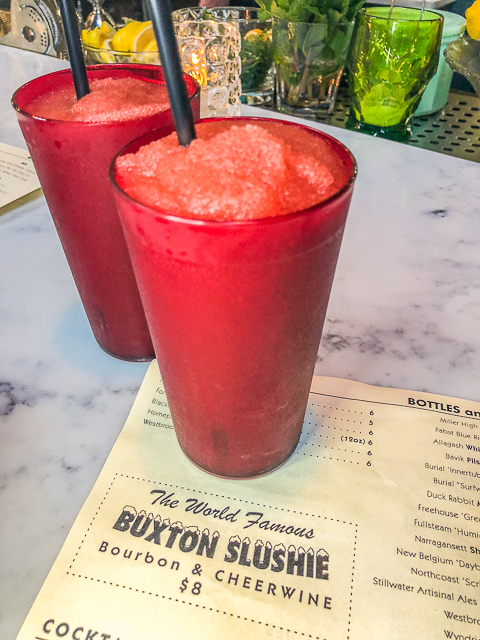 Everyone said to get The World Famous Buxton Slushie. It is made with Bourbon and Cheerwine. Cheerwine is a regional soft drink that tastes kind of like Dr. Pepper. 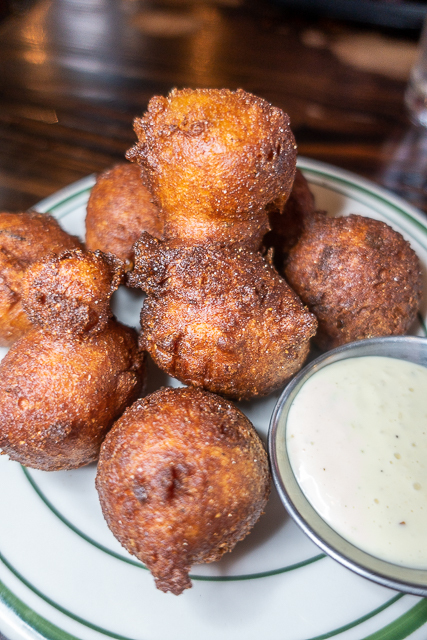 We started with an order of hushpuppies. They came out looking a bit burnt. Don't you think? They tasted fine, but I prefer my hushpuppies golden. We ordered two entrees to share. 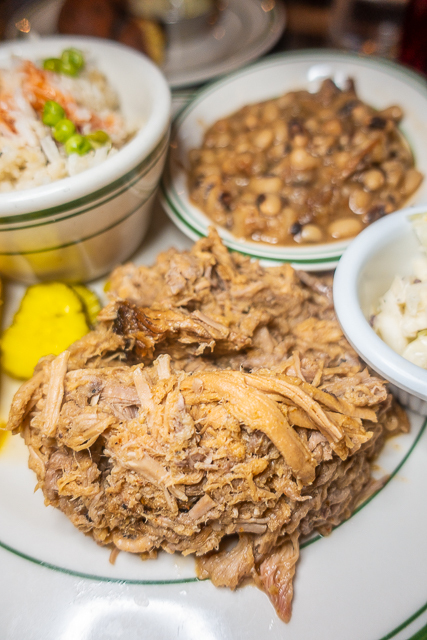 We got the pulled pork plate. 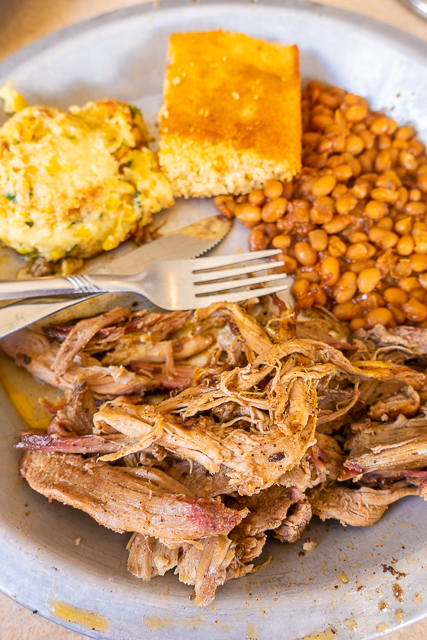 It is pulled from a whole hog cooked in the restaurant. It was a little mushy for us. 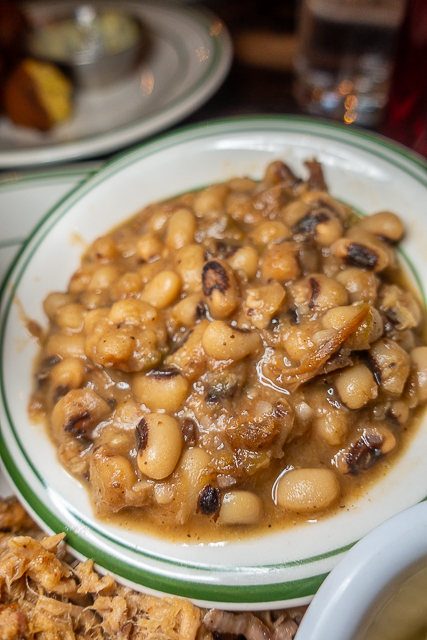 We ordered the black eyed peas. They were good. Just needed a little salt & pepper at the table. We were really intrigued with the Chicken Bog side. Well, it wasn't intriguing at all. Dry rice, with a few peas and one slice of chicken sausage. PASS on this one folks! 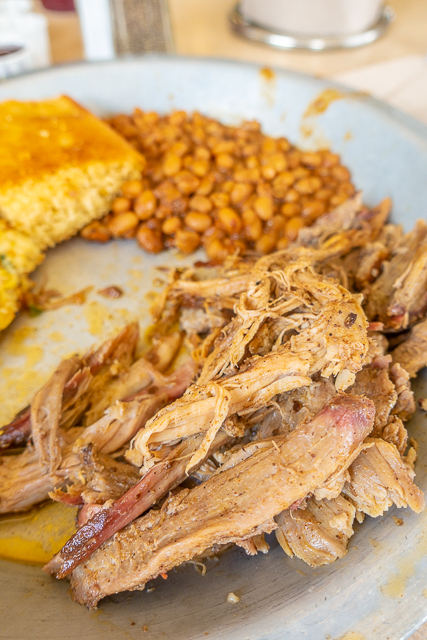 The pork plate came with a small slice of cornbread. Not my favorite. But, as my Mom would say, it was perfectly fine. 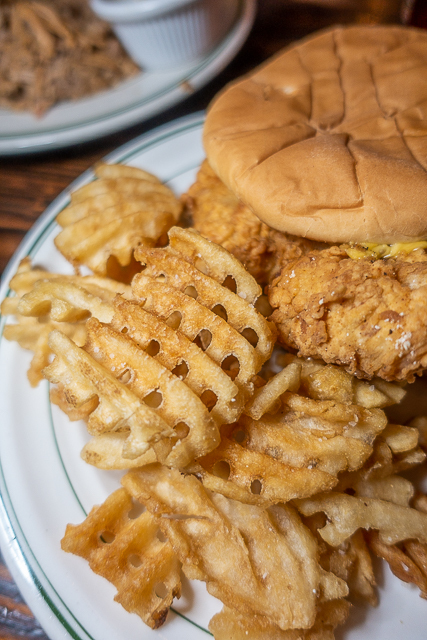 I had read a lot about Buxton Hall's chicken sandwich. 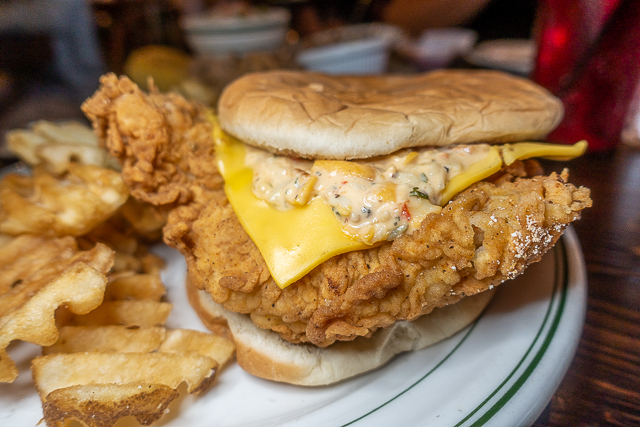 It was voted one of the best chicken sandwiches in the country by MSN. com. SO, it was good. I think they are trying to make it like Chick-fil-a. It definitely wasn't Chick-fil-a good, but we really enjoyed it. It comes with some yummy white sauce. I would recommend the chicken sandwich. Another nod to Chick-fil-a with their waffle fries. It was finally time to order dessert!!! Woohoo! AND they were out of the banana pudding pie. The whole reason I came!!! 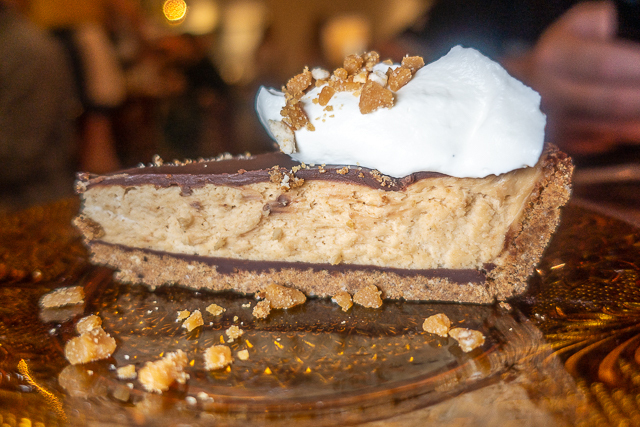 We opted for the Chocolate Peanut Butter Pie. It was really delicious! I would definitely recommend getting a slice. Overall, I don't really recommend Buxton Hall for dinner. If I came back, I would grab a slushie and a slice of pie at the bar. 12 Bones has been on my list for a long time. 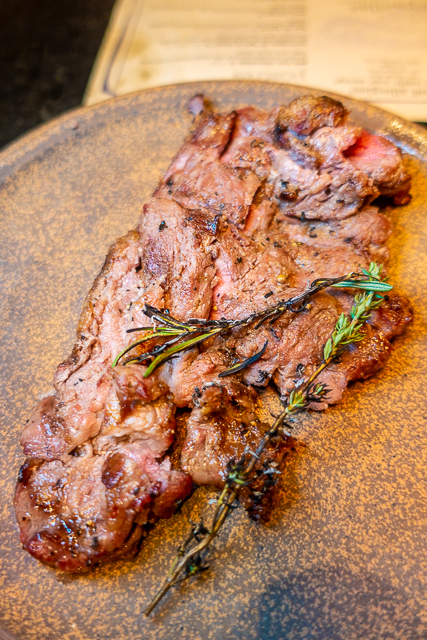 It went to the top of the list when our favorite foodie friends recommended it to us before our trip. 12 Bones is in the middle of nowhere. It is near the industrial train tracks and just a total dive. You order at the counter, get a number and they bring you the food and clean up the table for you. Chicken Legs got the Chicken Sandwich. He said the chicken was a little dry. I do think his review of the chicken was skewed because 12 Bones didn't have white BBQ sauce. Chicken Legs really only enjoys BBQ chicken sandwiches with white BBQ sauce. 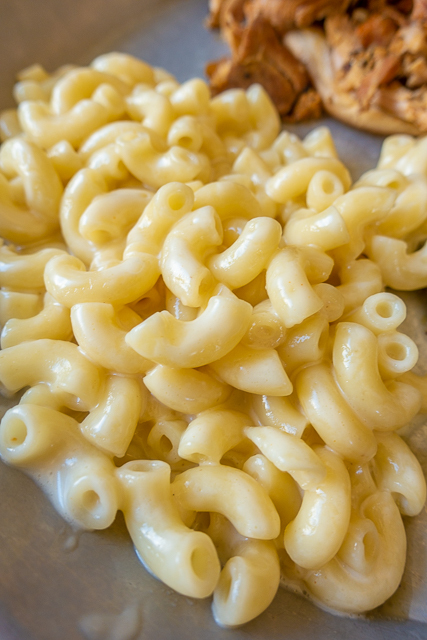 and the Mac & Cheese. Both sides were really good. I went for the Pulled Pork Plate. 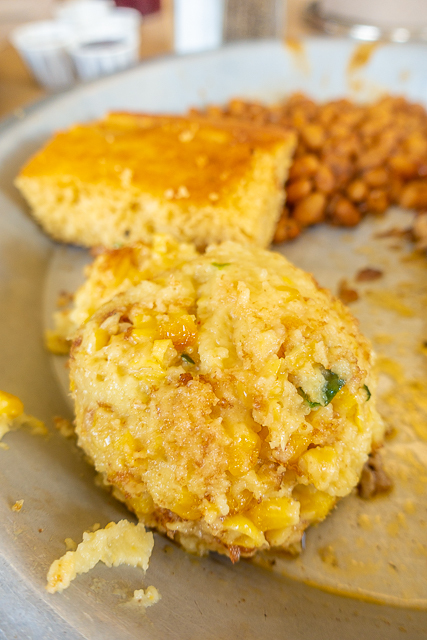 I got the Damn Good Corn Pudding as one of my sides. The pork was really good. Much better than Buxton Hall, but neither hold a candle to Saw's BBQ in Birmingham or Central BBQ in Memphis. 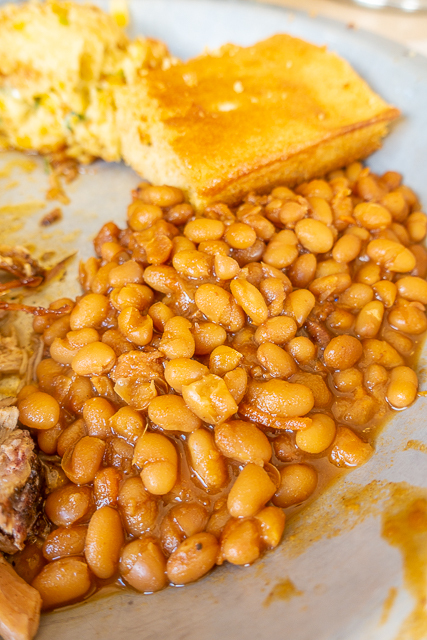 I also ordered the Baked Beans. Really good. I would definitely order both sides again!!! 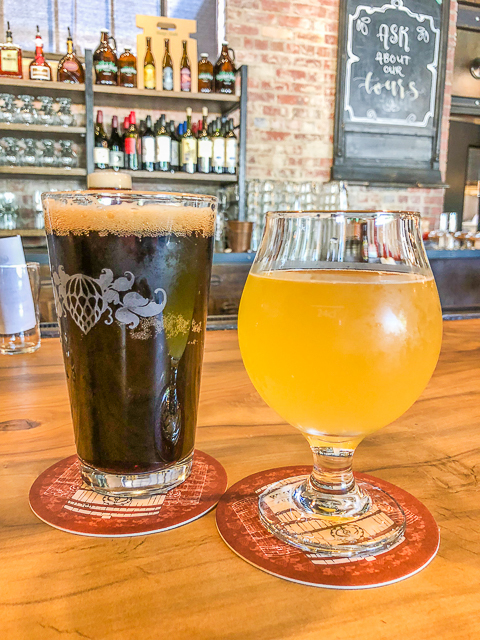 If you are looking for an eclectic place with good food, check out 12 Bones! My parents come to Asheville all the time. They told us that we had to check out their favorite bar. The bar inside the Battery Park Book Exchange at the Grove Arcade. 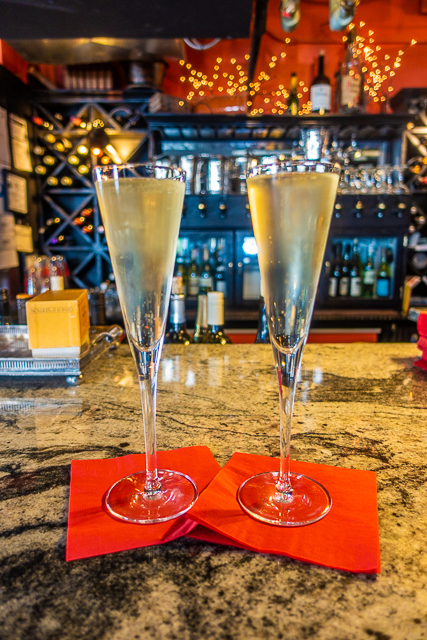 It is a great place to relax and have a glass of sparking wine and champagne. Wicked Weed was recommend to me by several people on Instagram. We took a Lyft from the hotel to check it out. Wicked Weed is a really fun place. We snagged a seat at the bar and had a drink before dinner. 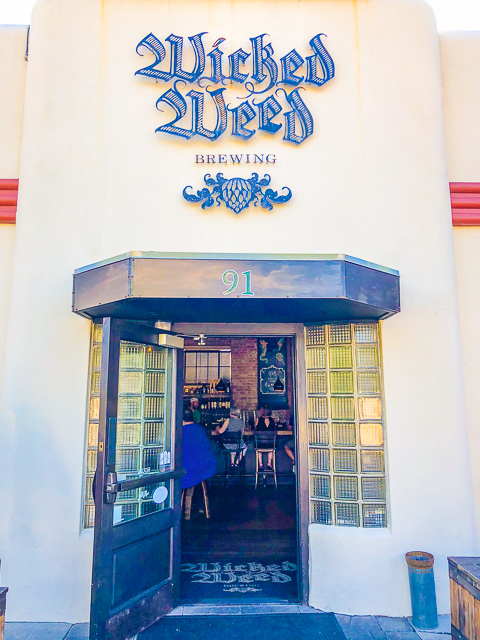 Wicked Weed serves food and it all looked delicious! We may try and eat lunch here on our next visit. I had Vinnie's on my list of places to eat dinner. I wasn't sure about going, but several people recommended it on Instagram, so we gave it a shot! I am SO glad that we did!! This place was PACKED! We came on a Monday night and it happened to be half-price bottles of wine - BOOM!! We got super lucky and snagged two seats at the bar for dinner. 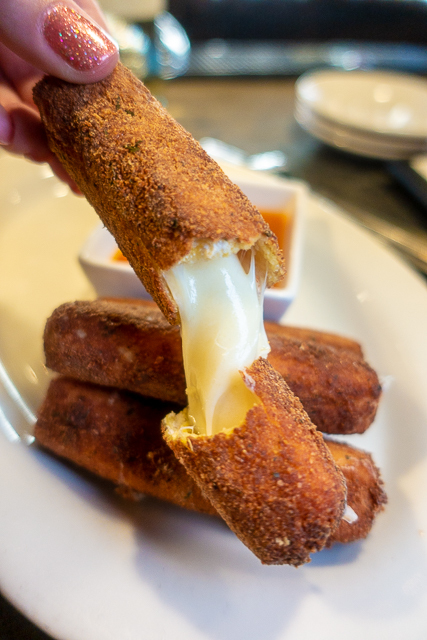 We started with an order of fried mozzarella sticks. 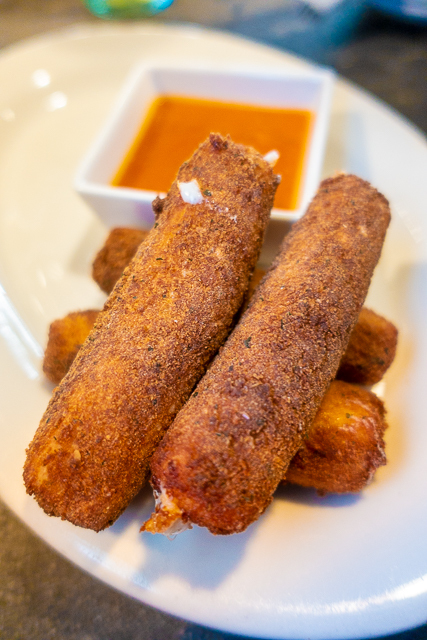 We LOVE fried mozzarella sticks and never turn them down. These were definitely homemade and delicious! 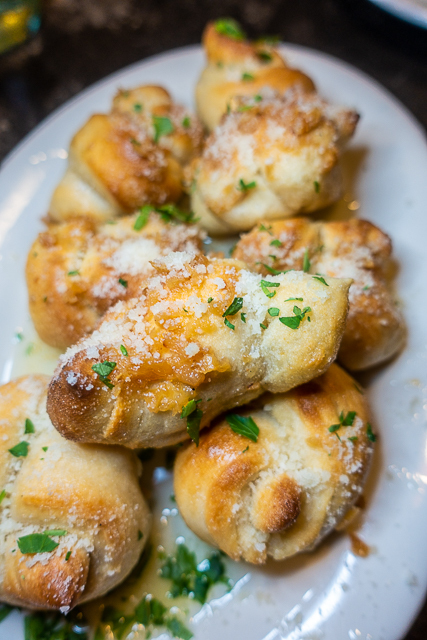 Next we ordered some garlic knots because I LOVE garlic knots. Chicken Legs got a side caesar salad. It was really good. 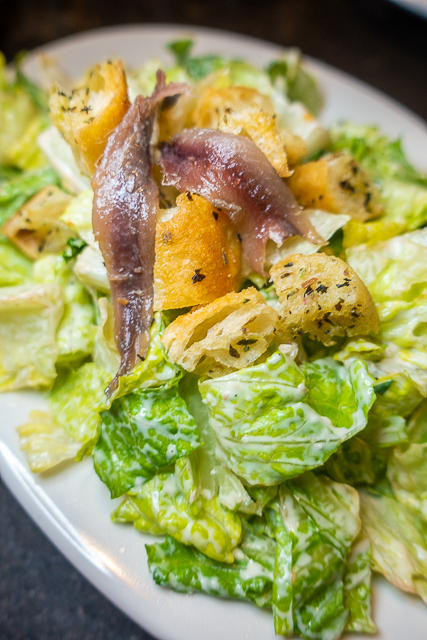 He said the anchovies were perfectly salty and delicious. 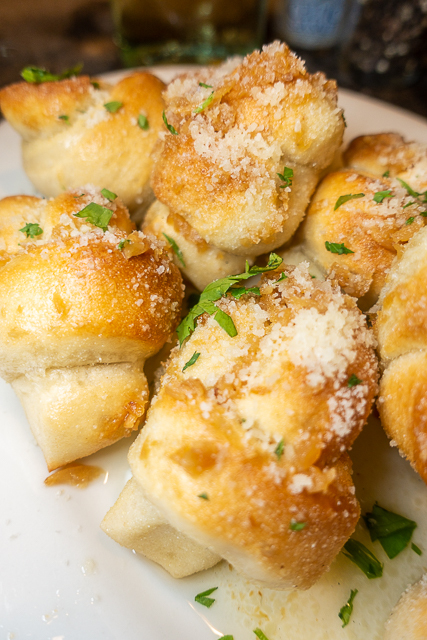 Another look at those garlic knots! I totally sopped up all the garlic on the plate! YUM! 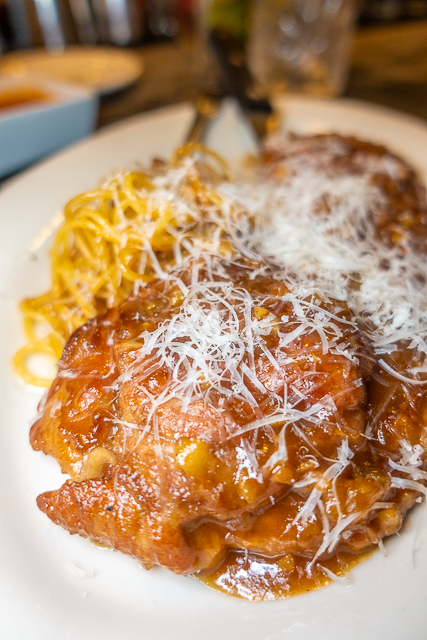 For entrees, Chicken Legs got the Veal Veal Saltimbocca - veal topped with prosciutto, sage, garlic, shallots, and marsala wine. He really enjoyed it. 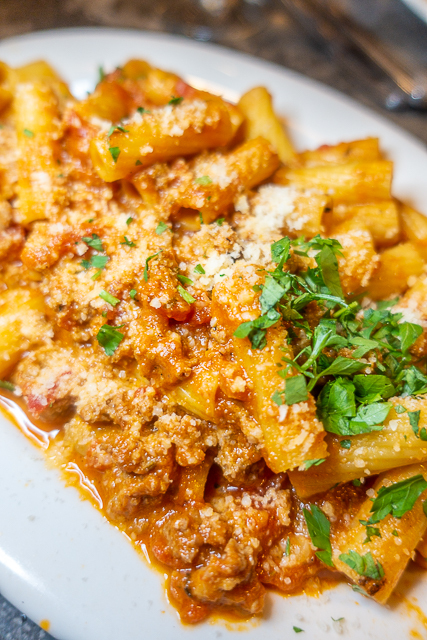 It was a tough decision, but I finally opted for the Rigatoni Bolognese. It was incredibly delicious. I almost cleaned my plate. 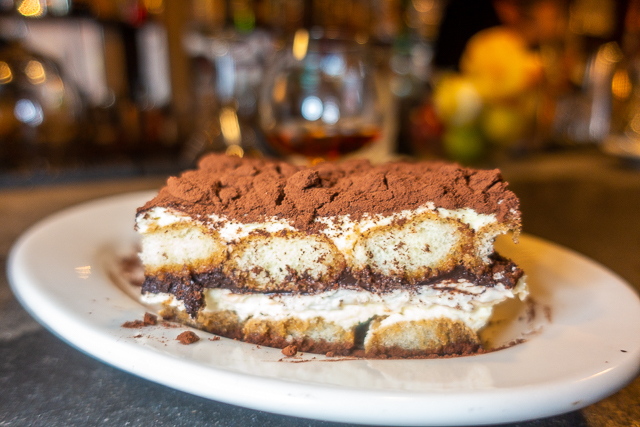 For dessert, we couldn't pass up the Tiramisu. Overall, Vinnie's was a fun spot for dinner. It isn't fancy or hipster. It is just really good food. I would 100% go back and totally recommend that you go when you are in town! 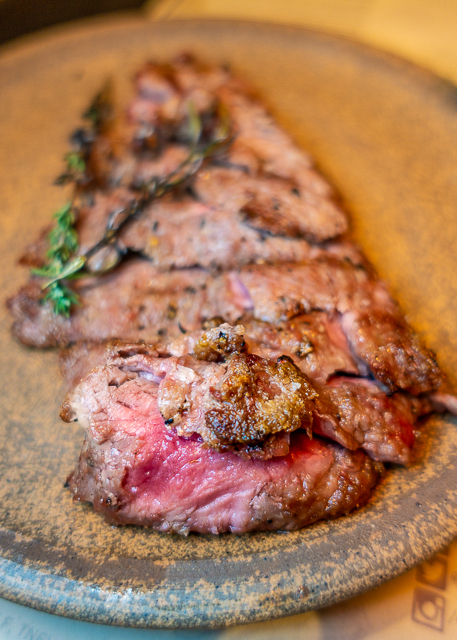 They don't take reservations, but it is worth the wait! 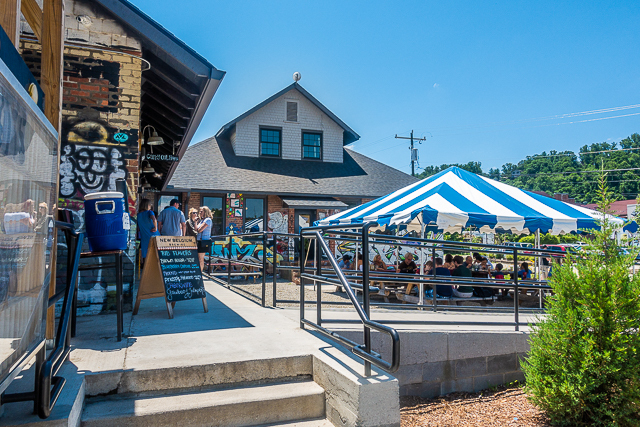 Sunny Point is another highly rated and recommended place in Asheville. It is located in West Asheville. We had to park a long way down the street, but it was worth the walk back. Like Buxton Hall, you put your name on the list with the hostess and they text you when your table is ready. We went on Tuesday for lunch. The special of the day was fresh made doughnuts. Chicken Legs has never met a doughnut that he didn't like, so we got one of each. 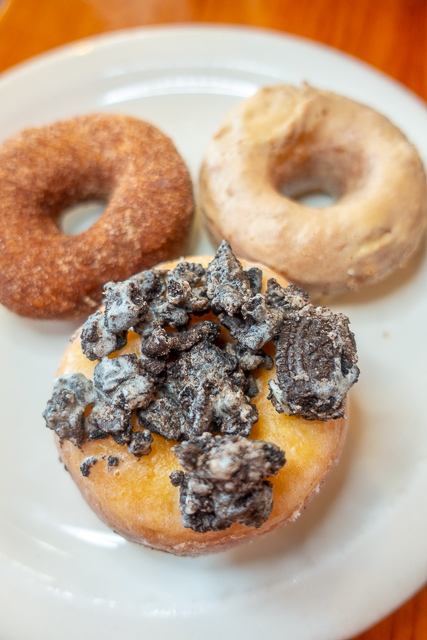 Cookies & Cream, Maple Glazed and Cinnamon Sugar. 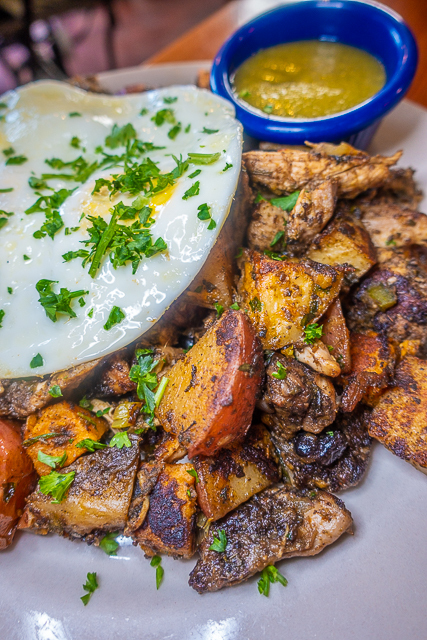 Chicken Legs got the Jerk Chicken Hash. It came with two eggs and a side of jalapeño salsa. He LOVED it. He said the salsa was incredible! 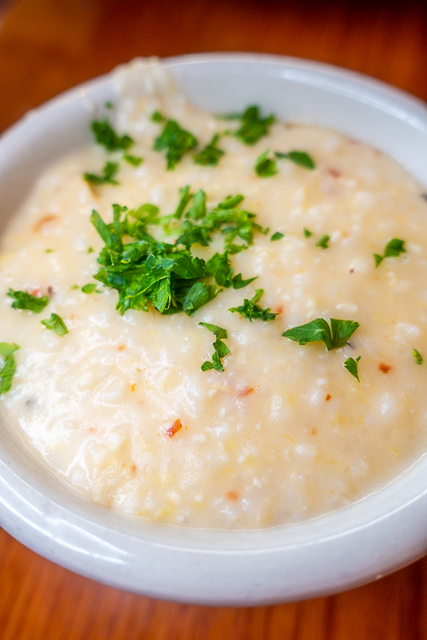 I started with an order of chipotle cheese grits - YUM! 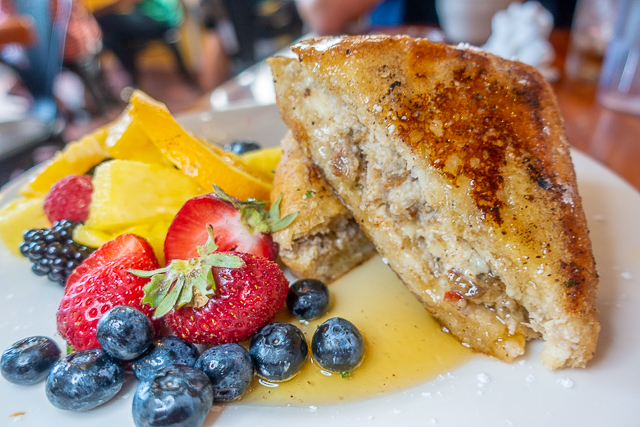 I got the Stuffed French Toast. It was stuffed with sausage and cream cheese. O-M-G! Y'all know that is one of my favorite flavor combinations. I loved everything about this dish! I am definitely recreating this at home! Sunny Point Café lived up to the hype. It is an eclectic joint with great food! 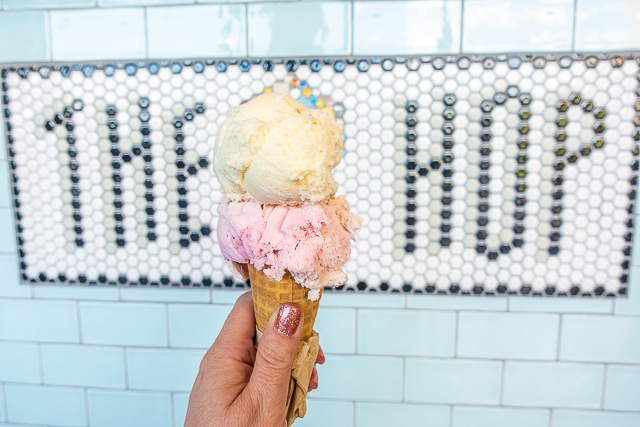 All the locals love The Hop Ice Creamery. It was a quick drive from our hotel, so we stopped by for an afternoon treat. 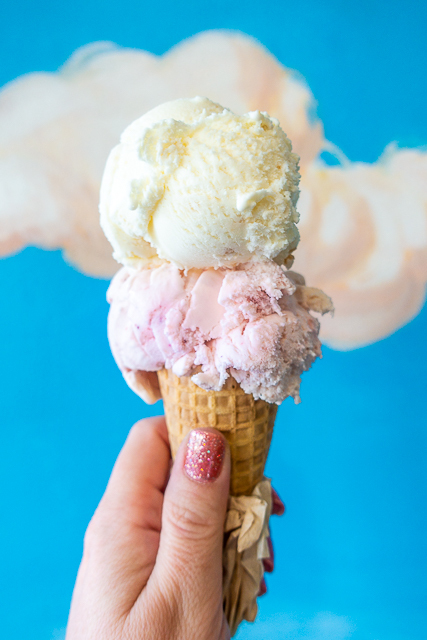 We got a double scoop of salted caramel and local strawberry. It was really good! They have tons of fun flavors and even do sundaes. Check it out if you need a sweet treat!! 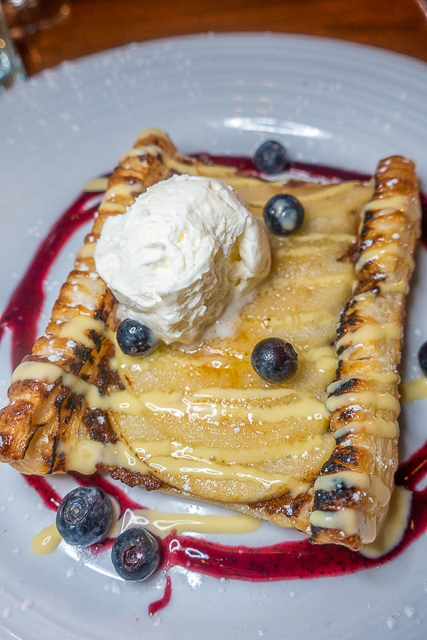 Bouchon is a fun and funky French Bistro. We met a friend for dessert/appetizers and drinks. They have a KILLER French 75! 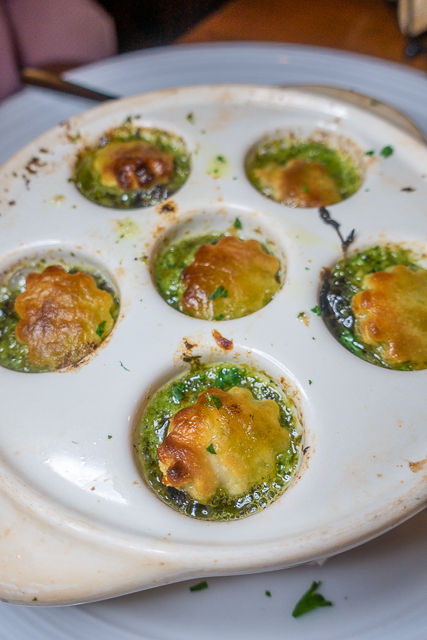 Chicken Legs got the escargots in garlic butter under puff pastry. 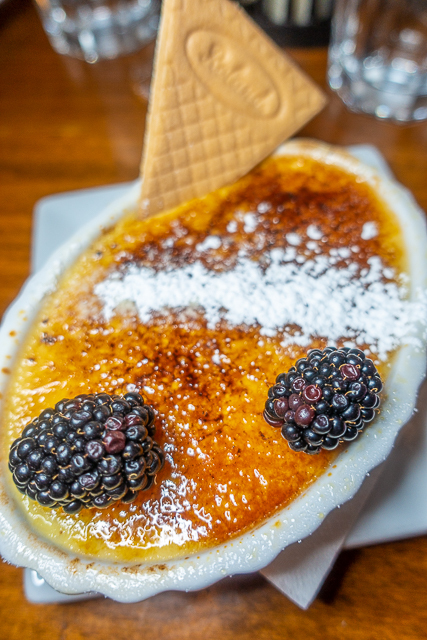 We have Bouchon on our list to try for dinner on our next visit. I was most excited about our dinner at Cúrate. Cúrate is a Spanish tapas restaurant. 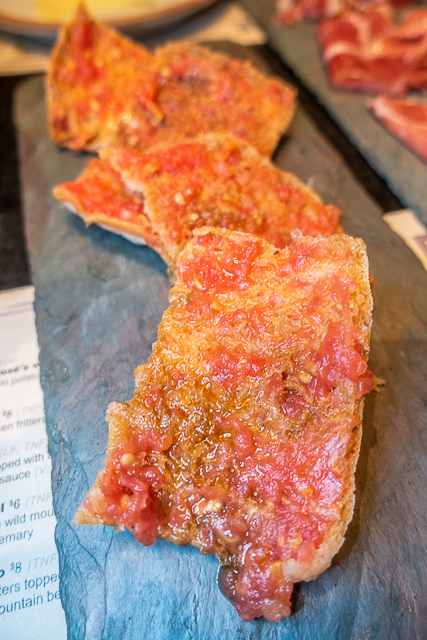 I looked at the menu and it sounded like everything I ate (and loved) when I was in Spain! 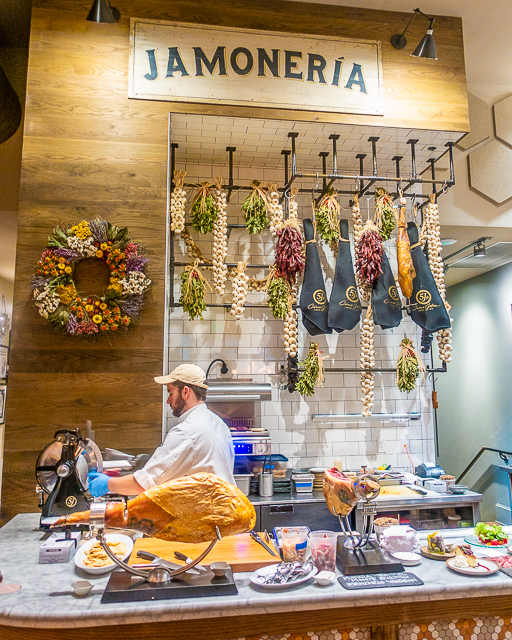 Even the Ham station looked like it did in Spain! We started with the tomato bread. I could have eaten plates and plates of this yummy bread. With our bread, we got a ham sampler. 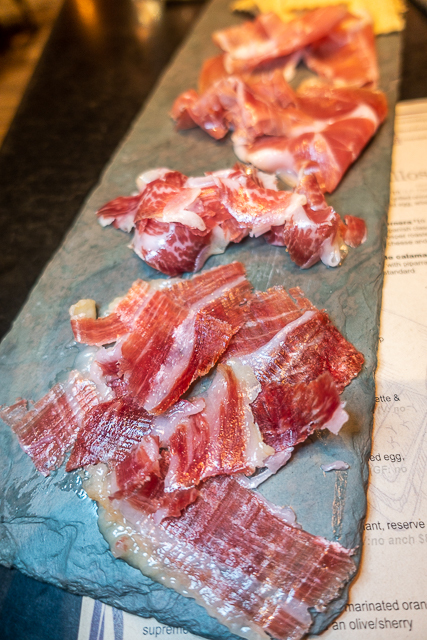 There were four types of ibérico ham. 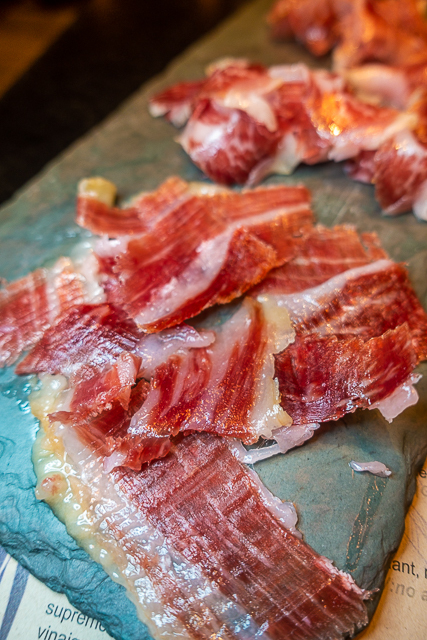 All as delicious as I ate in Spain. I could have just eat tomato bread and ham and been happy! BUT we kept going! I'm so glad we did! 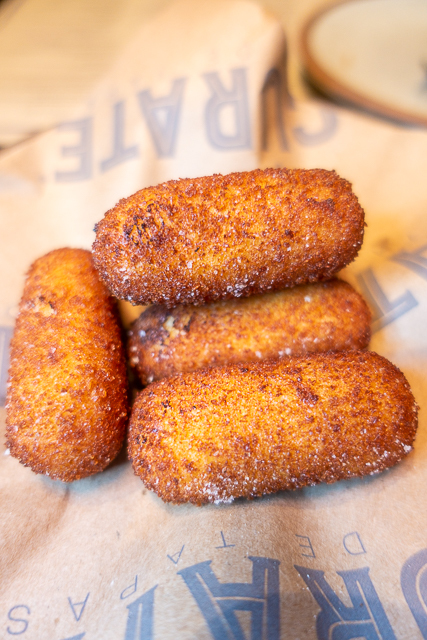 We got an order of the chicken croquettes. They were filled with a creamy chicken mixture. Really good. Next up was the best pork I've ever eaten. We both took one bite and were in foodie heaven. It is seriously the BEST pork I've ever eaten. 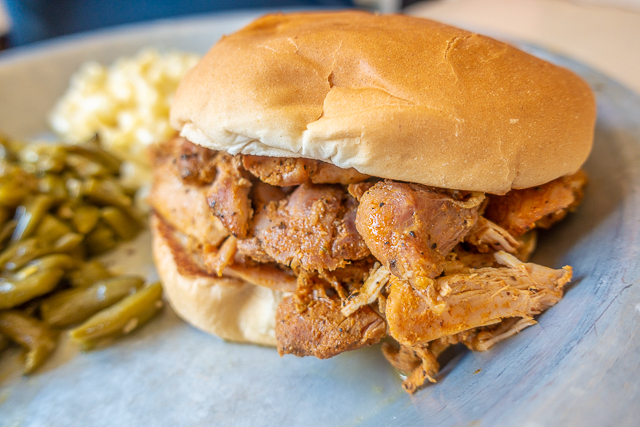 I would go to Asheville just to eat this pork. I would order my own next time so I don't have to share with Chicken Legs! LOL! 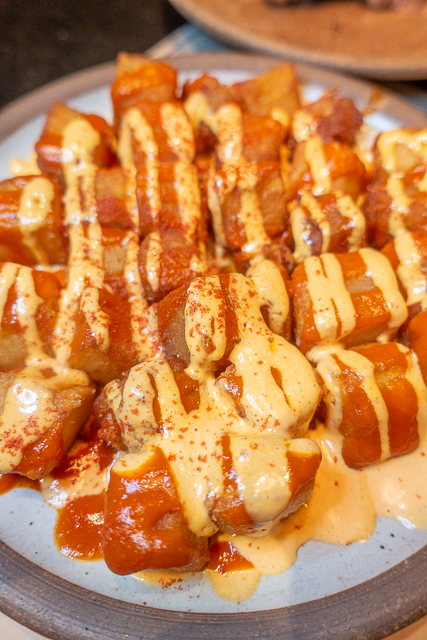 Finally we got an order of Patatas Bravas. If you go to only one place in Asheville, go HERE! One of the best places I've ever eaten. We both LOVED it. The restaurant is beautiful and the food is second to none. Get a reservation! They are busy! 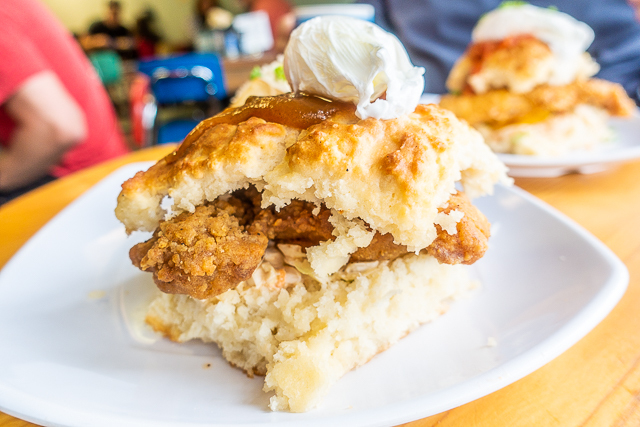 Our last stop in Asheville was at Biscuit Head. Almost EVERYONE said to come here, so we did! We got super lucky and walked right in and ordered. A line started to form after we got our table. Chicken Legs got the Fried Catfish Biscuit. 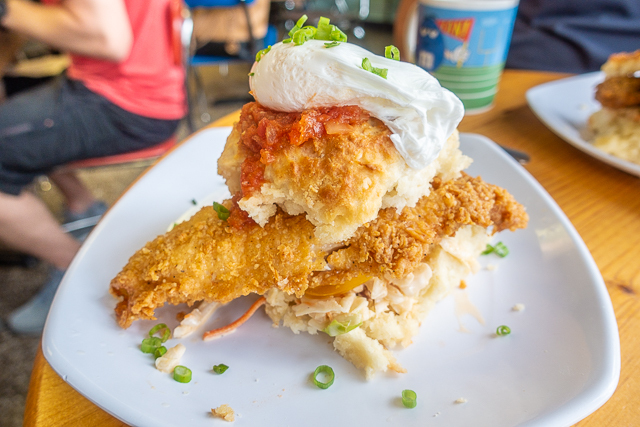 Biscuit with fried catfish, spicy slaw, tomato, poached egg, and creole gravy. 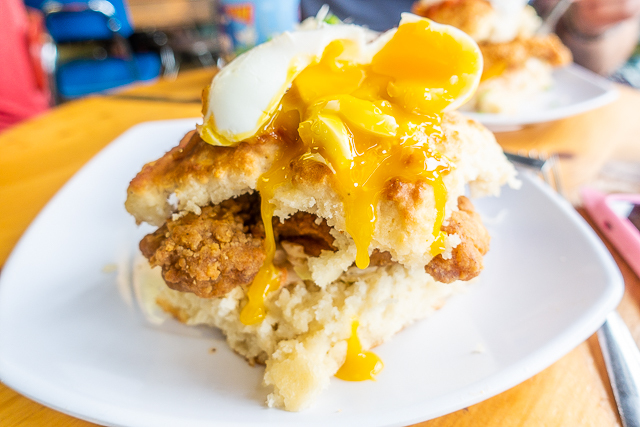 I got the Mimosa fried chicken biscuit. 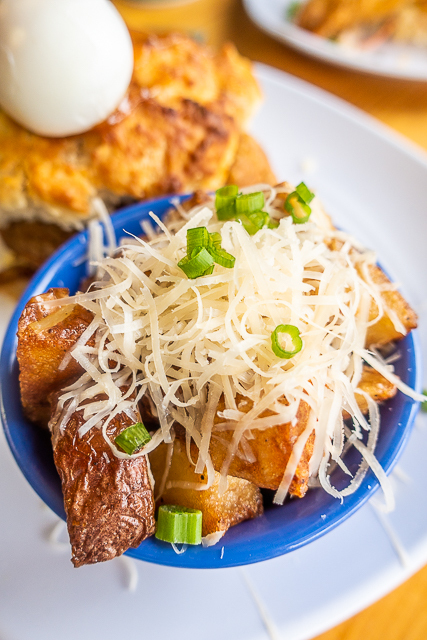 I also got an order of Moon Fries - home fries with shaved midnight moon cheese. Back to the Mimosa Fried Chicken Biscuit - it came with sriracha slaw and was topped with a delicious sweet potato butter and a poached egg. They have a fun butter bar with tons of fun butter flavors. 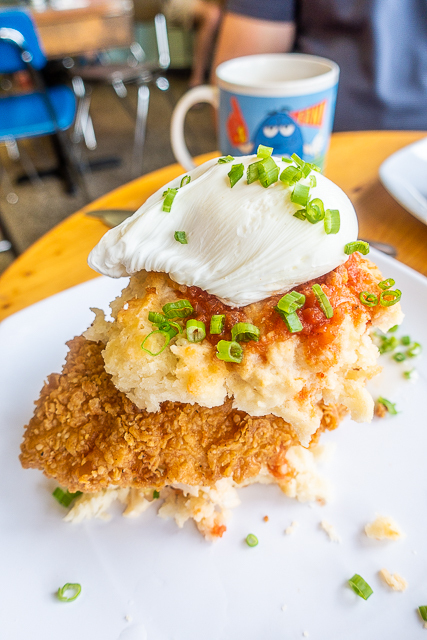 We both enjoyed Biscuit Head and would recommend stopping by for breakfast or lunch! There are several locations around town. Just pick the one closest to you. OMG! Can you believe we ate all this food?!?! We are still recovering. Lots of plain chicken for us the next few weeks. 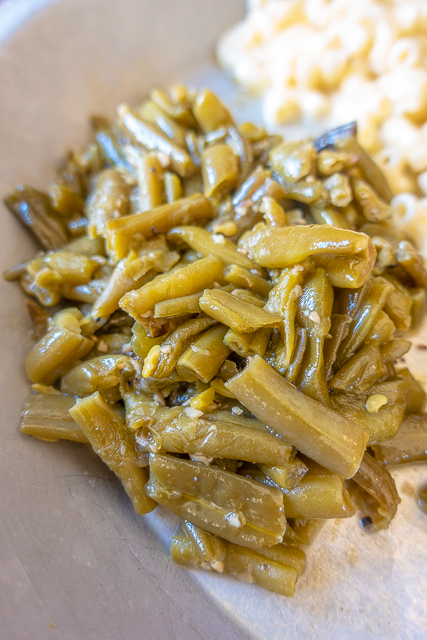 Do you have a favorite place to eat in Asheville? Any MUST EAT places we need to hit up on our next trip? Thank you for the suggestions!! 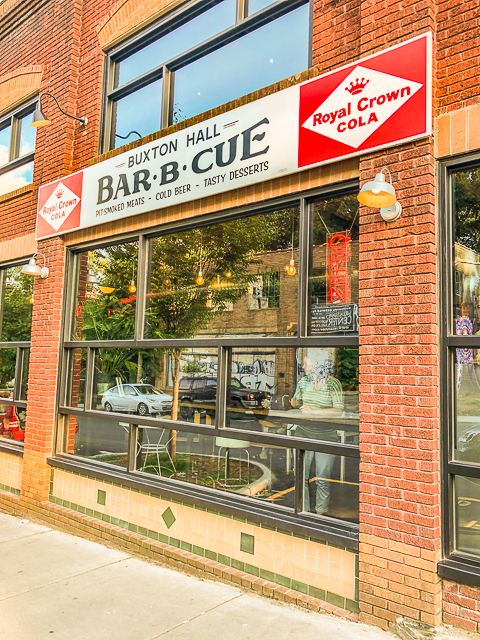 I know there has to be good BBQ in Asheville. We will check out Bonfire next time! We almost got the Carbonara at Vinnie's - definitely will try it next time. I second Bonfire! We went the last time we stayed in Asheville. It is away from downtown and the crowds which was a plus for us (because we needed a break from crowds) and the food was really excellent! I loved the "Adult Cheerwine" drink too. So good! 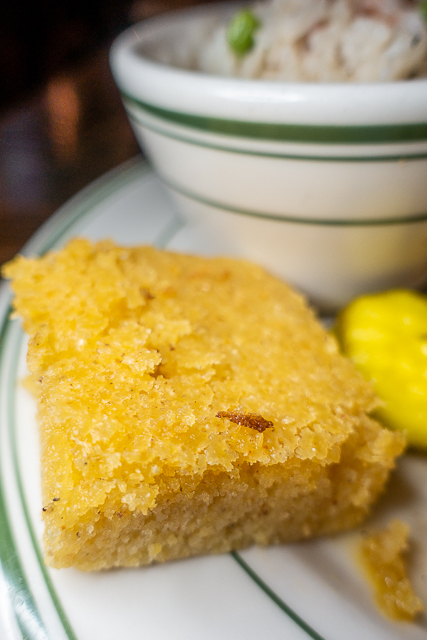 The next time you are in Asheville you should try Pete's Pies. They have the best chicken pot pie I've ever had. My friend got the curry pie and said it was amazing as well. The pie crusts are ridiculously flaky and delicious! Ummm, that sounds amazing!! Now I want Chicken Pot Pie! Adding it to the list. Just got back from Asheville, and we did a food tour. I highly recommend it, Asheville Food Tours. We did the brunch tour, and not only had great food, our guide was wonderful. Along with the food, we got a history and architecture lesson. All told with a great sense of humor! Sounds like SO much fun!! I'll check it out before our next trip! Thanks! 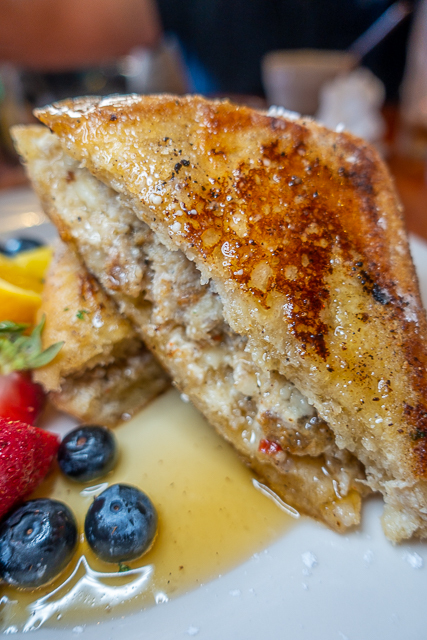 Can't wait to see your spin on the dausage stuffed French toast. It looked amazing!